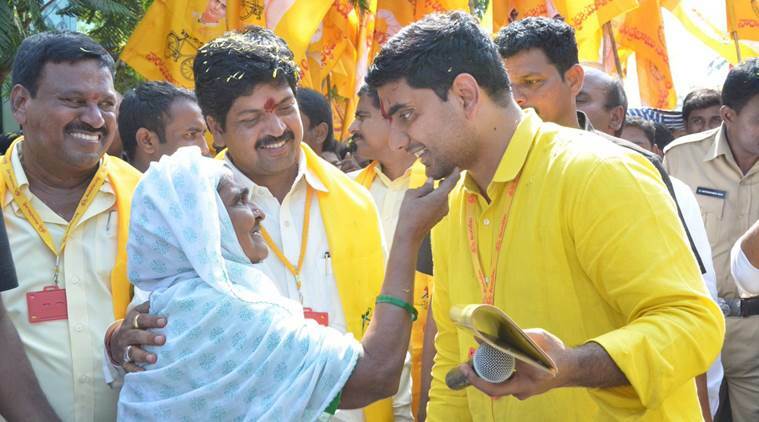 Chandrababu Nadiu's son Nara Lokesh declared elected as MLC. VIJAYAWADA: Andhra Pradesh chief minister N Chandrabau Naidu's son Nara Lokesh was on Wednesday declared elected unanimously to the AP Legislative Council in the MLAs quota. This paves the way for Lokesh's entry into the state cabinet, which is expected to take place after the budget session of the Assembly which is now in progress. Electoral officials declared Lokesh, TDP general secretary, and four other TDP nominees and two YSR Congress candidates elected unanimously for the seven seats in the MLAs quota. The formal election to seven seats in the Legislative Council was scheduled for March 20. However, with both the ruling and opposition parties fielding five and two candidates respectively as per their floor strength, officials declared all of them elected unanimously. The candidates will be given their election certificates on Thursday. Apart from Nara Lokesh, the others who are elected to the Legislative Council are: Karanam Balarama Krishna Murthy, Dokka Manikya Varaprasda Rao, P Sunitha, B Arjunudu (all TDP) Gangula Prabhakar Reddy and A Nani (both YSRC).